Since 1977, Beautiful Image, LLC has been a proud American manufacturer of durable, high-quality microcurrent cosmetic equipment for the face and body. Their exceptional on-site training and VIP Event Program ensures their clients are thoroughly educated in techniques and marketing. This first-rate preparation helps practitioners to prosper in the wellness industry by offering their clients a safe and affordable alternative to plastic surgery. The Beautiful Image microcurrent machine re-educates the muscles in the face and body, thereby promoting muscle memory. ï¿½The Lunch Time Face Liftï¿½ aids in toning and tightening facial skin; it also helps to diminish (even erase) fine lines, wrinkles and creases; it helps tighten sagging jaw tissues; and it helps widen the appearance of the eyes by lifting the brows and tightening the lids. Body Sculpting helps to tone and lift the buttocks, legs, hips and abdomen. The LZR7 Class III Induction Laser is one of the most advanced lasers for allergy detection and elimination in the industry. This system is made to calculate negative body responses for thousands of allergens through safely exposing the body to the harmonic frequency of each allergen. Once the list of negative body responses (allergies) is detected, your nervous system is retrained through immune conditioning to not have these negative responses. In addition to the red and green lasers, the LZR7 now offers the violet laser specifically for skin issues such as psoriasis or acne. Also, all three lasers are housed within the same hand-held device. These lasers can be run in tandem or individually. 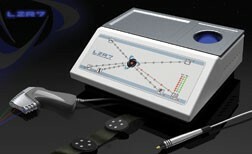 Each laser can be pulsed at different speeds for different healing properties or can be run with a Schuman Wave. With these lasers, the actual remedy is loaded within the light of the laser and administered into the allergy point of the body. This is similar to fiber optics in that the remedy is contained in the light beam. The new wrist cuff has 8 channels of detection and guarantees accurate placement of detectors along your wrist each time. The newly designed cuff can also be altered for detection on the leg if needed. It adjusts to fit all sizes, toddler to adult, which means no changing cuffs for different clients. The harmonizer used to imprint products is now built into the base of the system; it is therefore more compact and there is no need to change attachments, resulting in faster treatment times. The all new software is user friendly, easy to learn, and allows for quicker treatment times. An Internet training system allows you to train in your office as well as allowing for new staff to be trained at any time. Texas Biostetic Instruments announces one of the newest non-invasive, aesthetic breakthroughs. The Biostetic Jet Peel unit performs a “microderm-abrasion” type of treatment but without the pain, redness, messy treatment factors or downtime normally associated with this very popular service offered by many skin care facilities. The Biostetic Jet Peel uses a compressor system to produce 3 small jets of sterile saline traveling just under 200 miles per second. In an elegant comfortable treatment, the pressure-wash-type method exfoliates the top layer of skin while simultaneously deeply hydrating the skin; it also opens “micro skin channels” to receive nutritional products such as collagen, hyaluronic Acid, Vitamin C or countless other TBI topical solutions. The Biostetic Jet Peel also features a built-in LED light tower to provide dynamic photo therapy treatments as well. With the ability to create an ozone solution from room air, the unit also provides the additional option of providing facial and body oxygen treatments. Moreover, TBI has added the latest in radio frequency technology, Tri-Polar Radio Frequency with applicators for both the face and body to enhance skin tightening and fat melting opportunities. Since 2004, TBI has evaluated equipment and products in its own clinic, addressing the booming growth of consumers seeking non-surgical, non-invasive options for wrinkles and aging bodies. TBI specializes in chiropractic offices interested in added cash-only treatments and a proven marketing approach including marketing materials, website, and in-house promotional point of sale displays. For over 15 years, Theralase has been manufacturing and selling Class 3B therapeutic lasers worldwide. The company received FDA 510K approval in 2005. Theralase optimizes their product’s efficacy by utilizing true laser diodes that emit laser light in two wavelengths: 660 nm red laser light and 905 nm near infrared laser light. The laser wavelengths have been shown to stimulate cellular pathways in the body, helping to reduce pain and inflammation, and aiding in recovery from injury. When combining these wavelengths of laser with their “Super-Pulsed” technology, Theralase can deliver up to 50,000mW of peak power and penetrate tissue up to 4 inches in depth. This depth is very important because, when a practitioner buys a laser, they want to do more than just treat superficial conditions. And that is why, when adding a therapeutic laser to their practice, thousands of practitioners have made Theralase their choice. 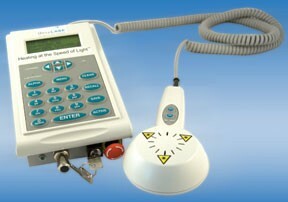 When you are ready to purchase a therapeutic laser for your practice, call Theralase. They are confident that one of their 5 products will not only fit your practice’s needs but will also suit your budget. To learn more about how low level laser therapy can improve your life and the lives of your patients, call Theralase or visit them online. In recent years there has been a great deal of consumer interest for technologies that offer non-invasive solutions in the area of inch-loss. Though many companies and technologies currently on the market offer claims of inch-loss success, few have proven results to substantiate these claims. The YOLO Curve by YOLO Medical, however, is one device that offers the science, the support and the results that have allowed it to emerge as a leader in this market. The YOLO Curve’s patented technology uses Low Level Laser therapy to penetrate the adipose layer of the fat cell, allowing its contents (triglycerides) to be released. Once these triglycerides are released and carried away by the lymphatic system, they are then processed metabolically and used by the body for energy. The YOLO Curve further addresses the need to support and stimulate this lymphatic process with patented technology that targets and stimulates the lymph nodes closest to the treatment area. This revolutionary technology provides effective results of 1 to 4 inches (or more) in as little as 20 minutes of pain free treatment. The YOLO Curve is effective at treating almost any troubled area of the body and definitely something to consider adding to your practice.